Trump says people need to be held accountable for the collusion hoax. Some are worried that he means it. I'm worried that he doesn't. President Trump has people of all stripes telling him to take the win on the Mueller investigation and just move on. Focus on the people's business. Pivot to infrastructure. Everybody agrees on infrastructure. All of this while the worst perpetrators of the hoax are still promoting the lie despite Mueller's report. But President Trump has made some noises recently on Twitter and at his recent rally in Michigan implying he is not ready to move on just yet. He says we need a fuller accounting of how this miscarriage of justice came about in the first place. I hope he means that. I'm afraid he might not. There are both Republicans and Democrats urging the president not to be vindictive; not to seek revenge for the three year long investigation mounted against him based on a hoax that started with some opposition research promoted by Hillary Clinton. Just forget about it, and open a new chapter of your presidency. All of this while the efforts of notorious liars like Adam Schiff, Jerry Nadler and Eric Swalwell to hamstring his administration continue unabated. The folks who maneuvered behind the scenes to create the hoax, to promote the hoax, and finally to investigate the president based on the hoax have failed in their efforts to overturn the results of a valid election. And now, as they recognize the danger they face in the exposure of their scheme, some of them are promoting a "let bygones be bygones" approach to the issue. Others, like the aforementioned Congress critters have chosen to double down hoping to bluff their way out of the discovery of their subterfuge. Their political futures are on the line. For others, their freedom may be at stake. I understand what motivates them; both the ones who are begging the president to move on and the ones who have chosen to double down. This is it in a nutshell: "We tried to frame you for treason, but we failed. Oh well. No hard feelings." Are they serious? Who would fall for that? But plenty will fall for it. Some who have no idea what happened, and many who know exactly what happened but don't want their partisan champions exposed. The question is has the president fallen for it. I am not convinced he really intends to pursue the issue further. I'm worried he is just trying to mollify members of his base and people like me who may not care for Trump all that much, but have a problem with the way they tried to oust him. Maybe Trump really does think it's time to move on. Or maybe it's a quid pro quo of some sort. Maybe Trump refrains from pursuing the treasonous cabal who tried to nullify the results of his election, and in return, they decline to vigorously investigate the stuff he may really be guilty of like the tax issues, the shady past business practices, the campaign finance minutia or the alleged emoluments infractions. There are reasons to wonder. For months, Trump urged the Justice Department to release documents to Devin Nunes' House Intel Committee. He urged them to remove the redactions that presumably concealed important information. He urged these actions, but he never compelled them. He promised to declassify and release documents relating to Nunes' investigation including the disputed FISA applications, then failed to do so after appeals from foreign governments. How much will we never learn in the name of preserving relationships with foreign governments that may have been as complicit in this attempt at a soft coup as were elements of our own government? How committed is Trump to exposing this entire sordid business. There are reasons to question his sincerity. I hope I'm wrong. I hope the fix isn't in. But I'm cynical enough to wonder. Some of the actors may have acted in good faith when the investigation of Trump was first initiated. They may very well have had some justification for their suspicions. But some knew, or should have known from the very beginning that the allegations were false. Many of those whose initial efforts were based on a sincere belief that the facts merited further investigation, nevertheless went on to break the law in pursuit of their suspicions. They did so because of political bias. Some of these people probably should go to jail. Some others, maybe not. But what they did needs to be uncovered, and everyone who participated in it needs to be exposed for whatever part they played in the whole affair. For those of you who think we should just move on, and especially for those of you who urge that course of action out of partisan fear that your political allies will be exposed and your political interests harmed, consider this. The man that you so despise; the man in whom you invested months and months of investigations in order to undermine and resist; the man whom you consider to be the ultimate danger to both our own country and indeed the entire free world; that man is now in charge of the exact same apparatus that your political heroes used in their almost successful attempt to illegally overturn an election. Nothing short of a full and complete accounting of this conspiracy can inoculate us from the possibility that some future administration, who knows, maybe even the administration of that very same Donald J. Trump, might attempt a similar soft coup against the next administration. Are you comfortable with the fact that Donald Trump now has the capacity to do to you exactly what your would be allies tried to do to him? I'm quite exhausted from listening to those who express concern over the so called reputations of the FBI and the Justice Department. I know that most of the folks in those agencies perform their jobs with integrity. But some were corrupt. I trust the worst elements have now been purged. The more exposure we give to the corruption that existed, the longer we can expect to go before the next episode of corruption occurs. Let's not give anybody the false sense of security that they can get away with something like this again by relying on a reputation that only exists because we were too afraid to look very hard for the truth. Call it a conspiracy theory if you like, but this is what I suspect. A not insignificant number of partisan government personnel attempted to overthrow, albeit in a non violent way, the elected government of the United States. 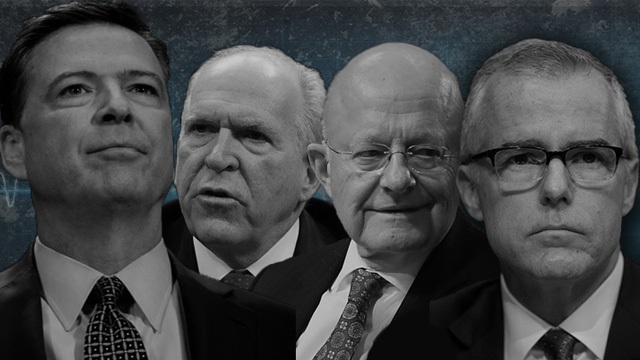 If keeping the deeds of this cabal a secret is your primary concern, then by all means press to abandon any further investigation, and just move on. If you're as concerned as I am that this should never be allowed to happen again, then I hope you will join me in urging the president to resist whatever self serving inclination he may have to broker a deal that offers sanctuary to the plotters. Even if that means rejecting some sort of promise of diminished scrutiny of his other alleged indiscretions. This has to be about America, not about Donald Trump. The preservation of our Constitutional form of elected government is dependent on the president stepping up now and being presidential.